Wondering what, if anything, people put between their camper and truck bed? 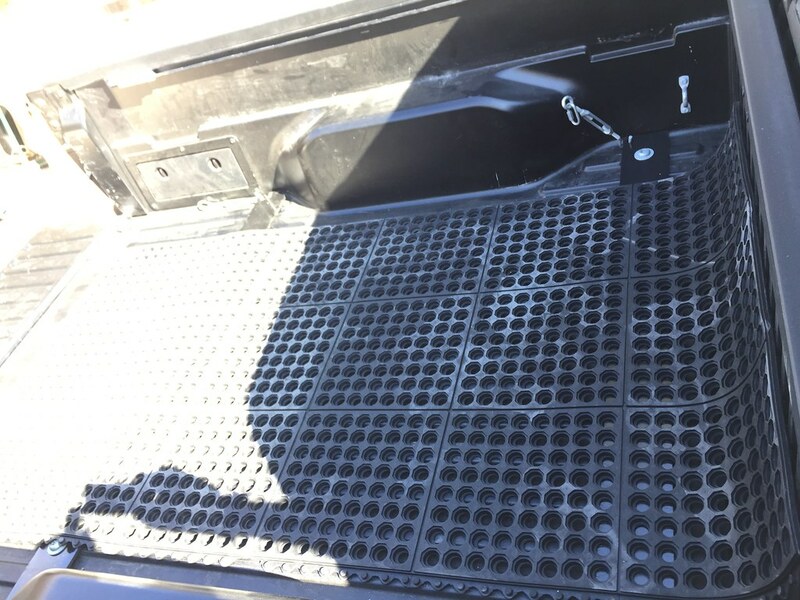 I have heard of people using a horse stall mat or heavy duty truck bed mat. Does this keep a slide in camper more secure, add height, etc? I don't have anything between the truck bed and the camper. Haven't had any issues at all with it like that. 4' X 8' X 3/4" thick Owens-Corning Foamular (the pink stuff). Needed height to get over pickup bed side. Very light, adds insulation, and moisture doesn't get between bottom of camper and the Foamular. 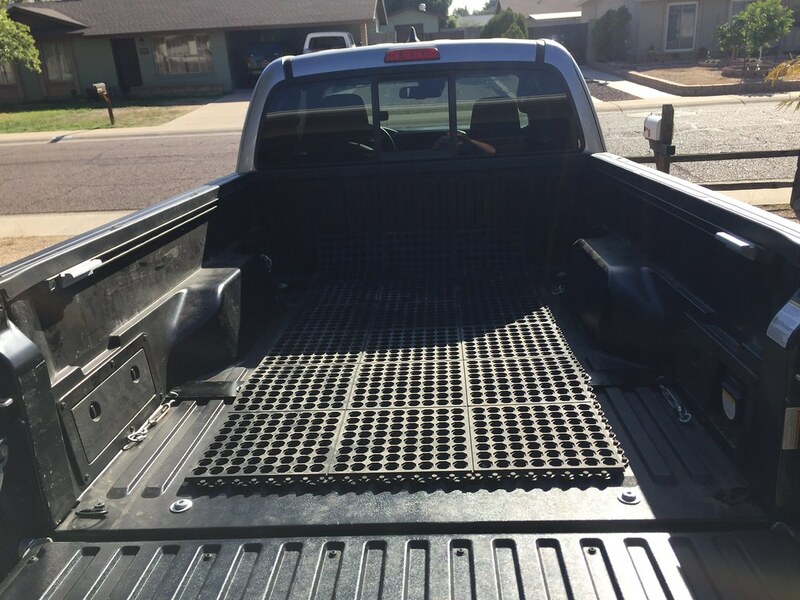 Stall mat, 4’ wide x 1/2” thick, with scraps filling in wider area from tailgate to wheel well. If you have the cab clearance, a 3/8 inch thick, sticky, fluted rubber bed mat is enough. The thick ones above will allow compression and expansion, rocking of the TC body, side to side on curves or undulating road surfaces and possibly in the arc of hitting your cab. Also, to contain the beast from sliding around, I use Lance camper Guides, essentially 4 metal triangles bolted to the bed, just wider than the base of the TC to keep the box from slipping from side to side. What's wrong with that, you ask? If the tie downs are tight it puts an extraordinary load on the stretched side. Jasan, love the power wagon, with a winch no less. What the jefe said. Because I needed to raise the camper in the bed to clear the cab, I had to build a 3" high platform. To the top of the platform I glued rubber tool box liner which is thin but very grippy - the Bigfoot is all slick fiberglas and that keeps it from sliding around. And I attached camper guides to the side of the platform to keep the camper centered on the platform. FWC Suggested I get a stall mat which I did. Think its 3/4" thick, not much give to it but it does raise the camper a bit giving me around an inch over the bed rails. When I take the camper off I think I will try to find a different solution. Ths mat is really heavy, guessing around 50-60lb. Every pound counts as far as the Tundras payload is concerned. I can see that it has a little grip on the camper, and probably soaks up a little shock along the way. Will def take a look at the Owens-Corning Foamular, keeping it light is very appealing. My experience with Formular on a narrow floor camper (Northern Lite 6"10') is that it will eventually compress under the front corners of the camper. The foam board I was using was Formular C300. I then switched to a heavy duty truck mat material available at Princess Auto (Canada) which I assume is similar to stall mat. It has some give to it but comes right back unlike the Formula. The rubber-like material is very heavy so I cut it into strips and used it in floor joist pattern to save weight.